The federal government is set to shut down at midnight. A short-term funding bill passed the House on Thursday, but Senate Democrats and a few Republican senators have signaled they could oppose the measure. 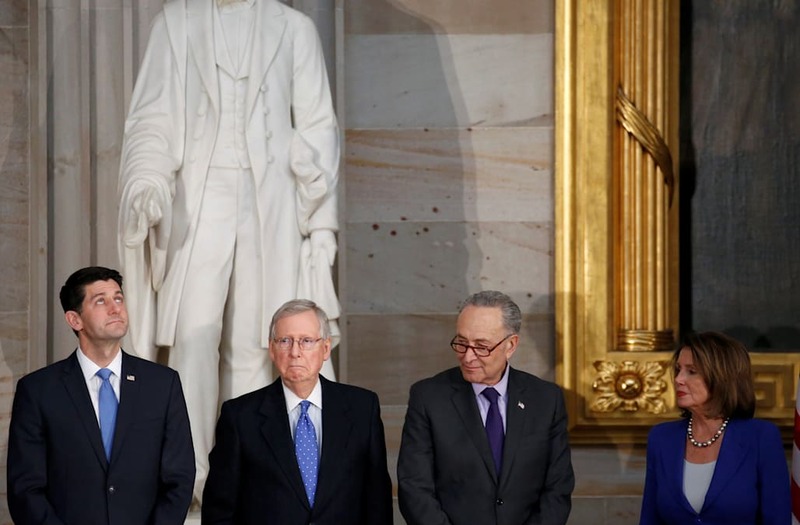 Both parties are blaming each other for the impending shutdown, with no clear solution in sight. Congress began Friday careening toward a partial shutdown of the federal government, as a funding bill appears stalled in the Senate with the two parties divided on key issues. The Republican-led House on Thursday passed a short-term funding bill that would keep the doors of the government open for another four weeks. But Senate Democrats and a handful of Republican senators have signaled they would oppose the measure. Due to Senate rules, such opposition would make it impossible to get through the chamber. If no bill passes by midnight, the federal government will enter a partial shutdown, with all nonessential services going into a freeze. The bulk of the resistance comes from Senate Democrats. They do not want to pass a short-term funding bill — known as a continuing resolution (CR) — because it does not contain a permanent fix for the Deferred Action for Childhood Arrivals (DACA) immigration program, which is set to expire in March. The DACA program protects from deportation roughly 700,000 unauthorized immigrants who entered the US as minors. President Donald Trump announced in September that he would end the program but gave Congress six months to codify the program. Democrats worry that without attaching the codification to must-pass legislation like the CR, Republicans will not agree to a separate DACA solution. Some Republicans have also expressed concern with the legislation. Sens. Lindsey Graham and Mike Lee have bristled at the idea of using another CR to fund the government, because it does not adequately fund defense spending — and its short-term nature leaves the military in limbo. Additionally, Sen. Rand Paul is generally against the CR due to the bill's projected deficit impact. The CR needs 60 votes to clear a key procedural hurdle in the Senate. So every Republican must vote for the bill, and — since Sen. John McCain is still receiving treatment in Arizona for a brain tumor — 10 Democrats must also be on board. A senior Democratic aide told Business Insider that there are enough votes to prevent the bill from passing. One possible solution to the impasse would come in passing a CR that only lasts a few days to give both sides time to reach a broader deal on DACA and spending caps. Senate Minority Leader Chuck Schumer tweeted in support of an even shorter-term CR late Thursday. "I support an idea floated by my @SenateGOP colleagues: pass a clean CR for a few days to give us a hard, final deadline & keep both sides at the table," Schumer said. "We’ll reach a deal that fully funds our military & the opioid fight, CHIP, vets, pensions, disaster aid & protects Dreamers." I support an idea floated by my @SenateGOP colleagues: pass a clean CR for a few days to give us a hard, final deadline & keep both sides at the table. We’ll reach a deal that fully funds our military & the opioid fight, CHIP, vets, pensions, disaster aid & protects Dreamers. Additionally, some Republicans advocated for the idea on Thursday. "I don't know whether we're close to an agreement or far from agreement, but either way this makes sense to keep the government funded and require us to continue negotiations until we reach a conclusion," Sen. Jerry Moran told Business Insider. GOP Sen. Thom Tillis said he was open to any solution that prevented a shutdown. "I'm open to anything that actually gets us consensus on the CHIP program and a number of the other things that we're doing," he said. "But I am absolutely not going to be a party to shutting down the government. It doesn't make sense. There's a lot of people at stake." The stalemate in the Senate has also ignited early stages of the blame game, with each party pointing a finger at the other side. Republicans are targeting the Senate Democrats, saying their obstruction is the core problem preventing an agreement from happening. "Now, it’s up to the Senate. Now will Senator Schumer and the Senate Democrats do the right thing by the American people, or will they force a government shutdown?" House Speaker Paul Ryan said in a statement Thursday. In fact, House Republicans have even taken it as far as to start a website schumershutdown.com, to attack the Senate Minority Leader. Democrats, on the other hand, say that the GOP should have included them their initial discussions, and they point to potential defectors in their own party as evidence the blame should not rest on their shoulders. The FDA closely watches foods that have exhibited contamination in the past and certain foods have caused more illnesses than others. A recent multi-drug resistant outbreak of salmonella has sickened 278 people in 17 states. The government has recalled the contaminated chicken and issues a public health alert. The Center for Science in the Public Interest believes this could have been stopped more efficiently had the government been operating normally. Salmonella lives in the intestinal tracts of chickens, which is why eggs are at high risk for salmonella contamination. Since eggs have caused a whopping 352 outbreaks and 11,163 reported illnesses, it's important to wash them thoroughly and cook them well. The FDA once discovered lead and arsenic in fruit juice concentrates from Argentina and China. One eight-ounce serving contained three times the amount of lead said to be safe for children. Berries have been the culprit of over 25 outbreaks and caused 3,397 illnesses. Since they have been linked to contamination in the past, it would be smart to take extra precaution. Contaminants like salmonella and E. coli have been found in imported cheeses from all over the world. The FDA also keeps an eye out for nitrates in cheese and other dairy products. In 1986, The DEA discovered herbal tea made from “decocainized coca leaves,” which ended up in Hawaii, Georgia, Chicago and other locations on the East Coast. The FDA has been closely monitoring tea ever since. Roughly 80 percent of the seafood we eat is imported, hailing from regions in Southeast Asia, which could have more lax regulatory procedures according to Caroline Smith DeWaal of the Center for Science in the Public Interest. The USDA has prohibited the import of meat from countries with a history of mad cow disease outbreaks; however, this rule doesn’t apply to dietary supplements. The FDA has been keeping a watch for contamination in shipments of supplements. Leafy greens have caused 363 outbreaks. 13,568 reported illnesses too, which probably because greens are not cooked at a temperature that would kill off bacteria. Norovirus accounted for 64 percent of the cases and comes from unwashed hands. The FDA has kept a close watch on milk products from China ever since 2008, when thousands of babies became ill from a contaminated formula. The culprit was a chemical called melamine, which is toxic if swallowed. Keep an eye out for products that list milk as an ingredient like yogurt, frozen desserts, chocolate, cakes, cookies, soft candies and beverages. The FDA is always hard at work making sure our food supply stays safe. Curious about what else the FDA has recalled recently? Read on for more! Recently the FDA recalled several Angel Food Cake products because they contained soy and milk allergens. The FDA requires foods with potential allergens to be listed on the item. The FDA was concerned that people with allergies or sensitivity toward milk and soy could have potentially fatal reactions, but no illnesses were reported. The FDA discovered Listeria monocytogenes in several ready-to-eat salads, slaw and dips. The organism can cause very serious and potentially fatal infections in young children, the elderly and people with weakened immune systems, but fortunately no illnesses were reported. Several frozen pork dumplings were found to contain allergens like shellfish and fish, but no illnesses were brought to the attention of the FDA. The FDA found unusually high contents of lead -- about 28 parts per million -- in a turmeric spice powder, which they then recalled. High levels of lead are particularly risky to infants, small children and pregnant women. Several almond butter products were voluntarily recalled when metallic fragments were found in some items. The recall was more of a cautionary measure and no one was harmed from the fragments. When metallic shavings were found in a few ice creams, a voluntarily recalled occurred on several products and the FDA received no reports of illness. The FDA found traces of Sibutramine in a dietary supplement, which prompted the company to issue a recall. Sibutramine was removed from US Markets in 2010 because it can increase blood pressure and poses risks for individuals with a history of coronary artery disease, congestive heart failure, stroke or arrhythmias. The FDA found Salmonella in several red and green bell peppers recently and advised a recall. Salmonella can cause serious infections in young children, the elderly and people with weakened immune systems. Undeclared soy was found in over 4,000 apple-cinnamon muffins. Since soy can cause bad reactions for those with soy allergies, the product was recalled. When it was discovered that several smoked fish items were not cooked properly, all of the products were recalled for fear of Clostridium botulinum contamination. This bacterium can cause illness or even death, but there were no illnesses reported. Trump weighed in on the impasse using his preferred platform Friday morning. "Government Funding Bill past last night in the House of Representatives," Trump tweeted. "Now Democrats are needed if it is to pass in the Senate - but they want illegal immigration and weak borders. Shutdown coming? We need more Republican victories in 2018!" The rhetoric is typical of Trump's argument over the past few days, but a good portion of the disagreement between the two parties stems from the president's shifting position on a DACA deal and his "shithole countries" comments during a bipartisan meeting. The White House said Trump would not depart for his resort at Mar-a-Lago in Florida until Congress passes legislation. That means the president risks missing a party in honor of the one-year anniversary of his inauguration, which will reportedly cost $100,000 for a pair of guests.